Jim Phillips watches from the sidelines. 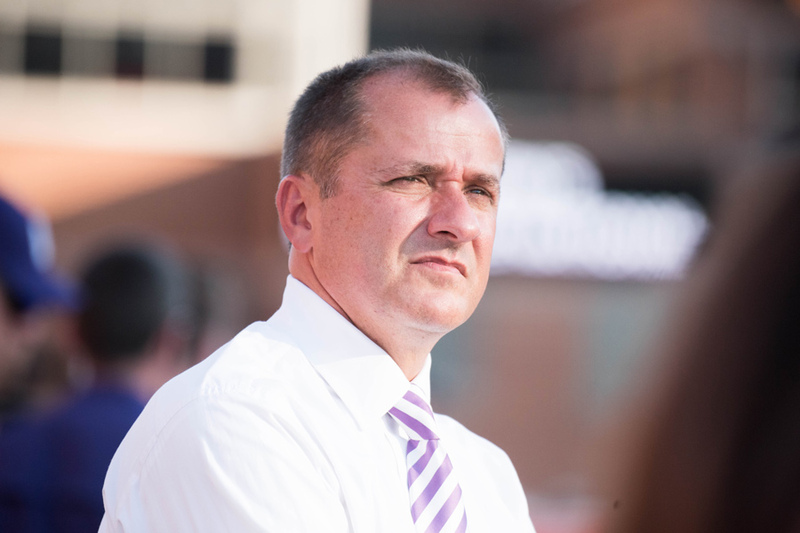 Phillips has served as Northwestern’s athletic director since 2008. The Daily’s sports desk sat down with athletic director Jim Phillips this week and discussed Northwestern football. Below are some of Phillips’ thoughts on the No. 23 Wildcats. His answers have been edited for length and clarity. The Daily: You didn’t wear a jacket at the Purdue game — what’s the story with that? Phillips: My blood runs hot, so it’s just not necessary. You know who has fun with it are the student-athletes. The game that really impressed them was when we were at Notre Dame, when it had just snowed there, a few years ago. They always ask me, no matter the conditions, ‘Dr. Phillips, you’re not going to wear a coat today, right? You’re not going to wear a coat?’ So, it’s become a little urban legend. The Daily: What are your impressions of this football team, and what have been your favorite moments of the season? Phillips: I’m just really proud of the string that they’ve put together, because I think that we are playing better, and I think we still have our best football ahead of us with the last two weeks and then a bowl game. I don’t know if I have a favorite moment, but I also know that this season could have gone the other direction, so I’ve really just enjoyed watching the student-athletes have success. Because I see them every morning out here at 6:30 in the morning. I see them here late at night. I see the time and energy that they’re putting into it. The Daily: Did you like the three straight overtime games? Phillips: No. I said to a group before the game against Purdue, ‘Welcome to Northwestern’s cardiac screening event. You think you’re coming in here to watch football, but we’re all going to put heart monitors on each of you, and at by end of the three hours, you’re going to have an assessment of how strong your heart is. So get ready.’ No, hey, that’s athletics, that’s what’s fun about it. But I have had the same sense that I hear the student-athletes talk about and the coaches: The more times you are involved in these kinds of games, and you have success, the more confident you become. The Daily: What was it like watching the students rush the field against Michigan State? Phillips: It was cool. I really appreciate the students that come out. People spend a lot of time talking about the students that don’t come out, and I surely wish that there were more that were coming out, but I’m more focused on the ones that do come out. And that was a special moment. We all have our feelings about what college athletics is. I think that’s one of the galvanizing moments that college sports has a chance to do on college campuses, and that is bring a community together. College is supposed to be fun. The Daily: Is the possibility that the Big Ten may not get a team into the College Football Playoff this year concerning? Phillips: I just think it’ll work itself out. And if we don’t get in, then we didn’t deserve to get in. We all wish we could go back. Ohio State wishes probably they could probably go back against Oklahoma, and Penn State wishes they could go back against maybe Michigan State or Ohio State. We’ll see how these last two weeks and the championship games go. And I sure hope we can get somebody in, because I do think the conference is strong. The Daily: Is there any particular bowl where you’d like to see Northwestern end up? Phillips: With this new bowl agreement, it’s just different in the sense that you used to be slotted based on your finish and how many wins you had, and now it’s not that way. The agreement is we’re going to rotate, over a six-year period, for whatever bowl. For the Pinstripe Bowl, over that six-year period, you’re going to have four, if not five, different teams in any given bowl. Which I think is great. You can go out to California and have a great experience; for those who went to New York, it was tremendous. The holiday time in New York — I had never been there at that time — it was amazing. So, where do I think we’re going? I really don’t know. We’re going to prepare and try to win the last two games.